Prior to our latest Pardot update, it has been a while since there had been anything new. But Salesforce took advantage of its flagship event, Dreamforce, to announce big changes! You may have noticed some already, and others are coming. Here is a summary of the major changes that will take place. First, the Pardot Lightning experience will be available to everyone as Pardot migrates to Salesforce Sales Cloud. In beta for a while, this Pardot App will now be integrated for everyone. Thus, everything will be accessible via a single platform, for better sales and marketing alignment. You will have a single identifier, which will mean simplified management of users. 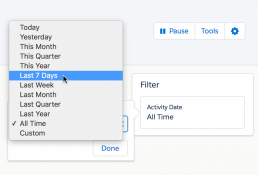 A new version of the Pardot / Salesforce Connector will also be available, which will pause the synchronization of leads, opportunities, custom objects etc. anytime. The second major novelty of this winter is Engagement Studio. This handy tool to orchestrate our campaigns can now bring our prospects more than once! Finish all the new “Engagement Programs” that are similar and that we have to repeat each time for each new event. A prospect can, therefore, enter more than once in the same program. How does it work? As in your automation rules, simply check the box “Allow prospects to enter the program more than once”, and then choose the number of times you want (either unlimited or enter one value). Of course, the reports will also change, so you can analyze the performance of your program over different periods of time. Also, a new feature will allow you to copy/paste steps from your Engagement Studio. We will not have to recreate the same courses again and again … A guaranteed time-saver! Finally, Salesforce has announced a new change that should please you as much as we do: e-mail and landing page templates will be completely revised for more intuitive, flexible and personalized use. More advanced customization will also be available, based on Salesforce Custom Objects. Regarding emails, you will now be able to send non-marketing communications even to prospects who have unsubscribed, such as delivery information, order confirmations, etc. We know that when a prospect is Opted-out of communications, it is very difficult to opt-in again. With new messages updated, Pardot administrators can change the status of this field to allow users to override a prospect’s Opted-out status to make it available again. Want to know more about the new version of Pardot or other platforms?